Come in a Ray-Ban protective carrying case with a cleaning cloth. 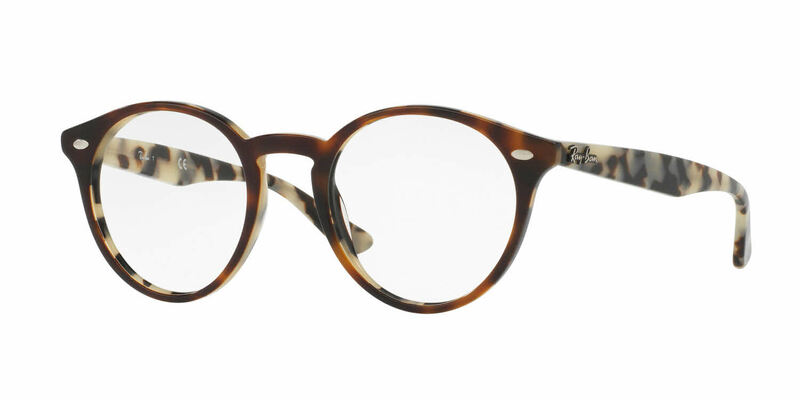 I loved these glasses when I first saw them online because of their retro look. I was nervous as this was the first time I bought glasses online without trying them on, but after receiving them and trying them on, I knew instantly that I had made the right choice. Great selection, prices, and service, FramesDirect has made a new lifelong customer. Quality frames at a reasonable amount of money. Look excellent on and the feel is great. The prescription that was added was spot on. Thanks so much Frames Direct. Will continue to order from here. Bought these glasses for my sister they are so trendy. She absolutely loved them. As always great products and service. This is my second pair of lenses/glasses that I have purchased from Frames Direct and both times I have been very pleased from the ordering process to receiving my glasses in a timely manner. This time I bought RayBan's RX2180V in #5540 which is the grey horn gradient trasp grey which looks great and even better on. I was debating between this color or color #5571 and I made the right choice for me. Frames Direct has such a huge selection of frames to choose from verse the local markets, so it was a no brainer for me again. Thank you Frames Direct for making my buying experience a pleasant one!!!! These frames are very round and decently large (especially since I have a large face) they seem to fit very beautifully on me. Quality is top notch, I've had these glasses for around 3-4 weeks now and they haven't been loose on the hinges or anything. They still look like how I first got them despite me being a little rough with them sometimes. I recommend anyone to buy these!